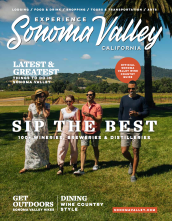 Just a short, 45-minute drive from San Francisco, Sonoma makes for an easy weekend getaway destination; and if you’re just visiting the Bay Area from out-of-state or abroad, there’s really no excuse not to tag a trip onto your vacation. Plus, you can take the Pacific Coast Highway, one of the most beautiful drives in the U.S., north from the Golden Gate bridge - making getting to Sonoma pure joy. Downtown Sonoma is also a beautiful historic landmark, with a perfectly-preserved plaza at its center; lined by historic adobes, a pristine Californian mission, and charming cobbled streets. From its days as a Mexican outpost to its role as a Spanish Mission town to its short-lived time as a frontier republic; Miwok Indians, Mexican generals and American outlaws have all called Sonoma home during the town’s long, rich history. Visit Sonoma Mission, explore General Vallejo’s first home - La Casa Grande - and soak up the historic atmosphere on a self-guided walking tour around Sonoma State Historic Park. The birthplace of California’s legendary wine industry, Sonoma remains a world-leading wine producer, with award-winning vineyards spread throughout its valley. Its wide variety of terrain, soils and microclimates allows vintners to craft an unusually diverse range of varietals and styles - from Cabernet to Chardonnay to Zinfandel - meaning something for every palette; while Sonoma’s 100-plus selection of intimate, family-run wineries ensures there’s no end to the tastings that serious oenophiles can discover. It’s rare to find such a diverse agricultural locale as Sonoma, where ancient olive orchards give way to organic farms that produce everything from fruits and vegetables to nuts and herbs. Even the most basic of the town’s eateries incorporate Sonoma’s incredible produce into every dish, and it’s no surprise to discover that the artisan food scene is thriving. From world-renowned cheeses and olive oils to handmade chocolate and craft brew beer, authentic foodie souvenirs and epicurean tastings are in no short supply. One of California’s top culinary destinations, it’s not just the wine lists that shine at Sonoma’s delectable, gourmet dining establishments. For a blow-out meal to remember, dining at the AAA Four Diamond, Sante, is worth a trip to Sonoma alone; Zina Lounge takes pairings to the next level with its limited production artisan bottles and gourmet Japanese-inspired menu; while Cafe La Haye does ‘sophisticated food without the fuss’ to perfection. Home to 13,000 acres of state and regional parks, boasting miles of trails and outdoor recreation options for all tastes and ages, Sonoma’s landscapes offer much more than vineyard tours and tasting rooms. Take in the views as you hike the scenic Overlook Trail, enjoy a family kayak trip on the nearby Russian River, tackle Hood Mountain, and more. Sonoma Valley provides the perfect backdrop for some serious pampering time - made even easier by its three, high-end hotels and spas. Whether it’s a massage amid spectacular gardens at the MacArthur Place Garden Spa; European-style relaxation at Willow Stream Spa, The Fairmont; or treatments using local ingredients at The Lodge Spa - relaxation and rejuvenation come guaranteed. Home to a burgeoning LGBT community, a number of TAG-approved accommodations, and specialist LGBT travel company, Out in the Vineyard - whose annual Gay Wine Weekend won ‘Gay Event of the Year’ in 2015 - Sonoma is a welcoming destination for visitors of all orientations. From the popular Sonoma Valley Museum of Art and numerous private galleries, to open-air theater in vineyards and historic ruins, plus a historic plaza and cobblestone streets that musicians love to perform in, there’s no shortage of art and culture to discover in and around Sonoma. Sonoma’s annual festival and events calendar is packed with a diverse range of activities and celebrations. From weekly farmers markets to traditional county fairs to world-renowned signature events, there’s no better time to visit, than when a festival comes to town.